This beautiful hand cast pendant is inspired by the designs found in ancient Celtic manuscripts, on stone carvings and in artefacts which show how skilled the Iron Age Celts were at metal working. Celtic artists worked in a style characterised by a balance of form, delicacy and most of all by its spirals and interlacing. 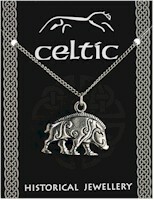 This Celtic Boar pendant is made from lead-free pewter and is supplied on a silver chain. The information card is a fold-over type with Celtic images on there front and historical information on the reverse. A salmon in pewter supplied on a pin with clasp. The information card gives details about the countryside. A bee made from pewter, supplied on a silver chain. The information card gives details about the countryside. Pewter reproduction of a Greek owl coin supplied on a pin with clasp. The information on the reverse of the card describes how Greek mythology appears on Greek jewellery designs and coinage. Pewter reproduction of Richard III's Boar Emblem supplied on a waxed cord. The information on the card is about Richard III's reign, his boar emblem and coinage.